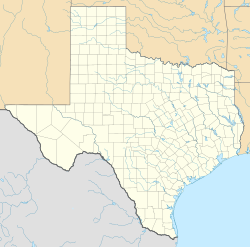 See: Naval Air Station Fort Worth Joint Reserve Base for the current use of the facility. see also: Air Force Plant 4 for the government-owned aircraft manufacturing plant adjacent to the facility. Carswell was a major Strategic Air Command (SAC) base during the Cold War. It was the headquarters of several SAC intercontinental bombardment wings, equipped with the latest heavy bombers from B-29 Superfortresses; B-36 Peacemakers and B-52 Stratofortresses. The west side of the airfield was home to Air Force Plant 4, a 602-acre (2.44 km2) industrial complex occupied over the decades by Convair, General Dynamics, and now by Lockheed Martin. The bulk of the Air Force Convair B-36, B-58 Hustler, F-111 Aardvark, EF-111 Raven and F-16 Fighting Falcon fleets were built there. With the end of the Cold War, and the subsequent downsizing of the American military, the 1991 Base Realignment and Closure (BRAC) Commission recommended that Carswell AFB be closed by 1994. Today, the facility is known as Naval Air Station Fort Worth Joint Reserve Base. It retains an Air Force Reserve presence as well as a Navy Reserve, Marine Corps Reserve and Air National Guard flying units where were formerly located at Naval Air Station Dallas. Carswell Air Force Base was named after Medal of Honor recipient Major Horace S. Carswell, Jr. (1916–1944). Major Carswell was returning from an attack on Japanese shipping in the South China Sea on 26 October 1944. He attempted to save a crewmember whose parachute had been destroyed by flak. He remained at the controls of his crippled bomber and died while crash-landing the B-24 Liberator near Tungchen, China. The base was renamed in his honor on 29 January 1948. Carswell's origins date back to the early years of aviation. After the United States' entry into World War I in April 1917, General John J. "Blackjack" Pershing invited the British Royal Flying Corps (RFC) to establish training fields in the southern United States where the warmer weather would be more conducive for flying year-round. In June, the War Department inspected 6 sites around Fort Worth, Texas which had been offered by the Chamber of Commerce. In August the War Department signed leases with the RFC on 3 sites around Fort Worth. Knows as the Flying Triangle, these sites were Hicks Field (#1), Barron Field (#2), and Benbrook (later Carruthers) Field (#3) based on their locations. In April 1918 these airfields were turned over to the Air Service, United States Army as training fields for American pilots. Hundreds of pilots learned their basic and primary flying skills at these airfields in the Fort Worth area during the war. They were closed in 1919 when the war ended. In 1940 the City of Fort Worth had filed an application with the Civil Aeronautics Administration (CAA), asking for a primary pilot training airfield for the Army Air Corps. In May, General Jacob E. Fickel visited Fort Worth on an inspection visit. Fickel had learned to fly at Carruthers Field in 1918. At the same time, the Fort Worth Chamber of Commerce was trying to convince aircraft manufacturers to build an aircraft assembly plant in the area. Consolidated Aircraft, wanting to build in the area, suggested to the Air Corps that they jointly build an airfield adjacent to the heavy bomber plant they wanted to build in Fort Worth. On 16 June 1941, President Franklin D. Roosevelt approved $1.75 million to construct an airfield next to the Consolidated manufacturing plant. The Army wanted to have the airfield ready quickly before the plant was put into production and construction of the "Lake Worth Bomber Plant Airport" began almost immediately. However, after the Attack on Pearl Harbor, the Army changed its plans and instead of being an operational base, "Tarrant Field", as the facility was called, became a heavy bomber training school. The first unit assigned to the base was the Army Air Forces Training Command Combat Crew School on 1 July 1942. At the same time, the Consolidated plant began assembly of B-24D Liberator aircraft in May, with the first aircraft being assigned to the school in August. On 29 July, the base was again renamed as "Fort Worth Army Airfield". The Army Air Forces Combat Crew School (later re-designated Army Air Forces Pilot School, Specialized 4-Engine) took graduates of Training Command's advanced pilot training schools and experienced 2-engine pilots and trained them on flying the B-24 Liberator. The school was officially opened on 12 October 1942 and was under the jurisdiction of the 34th Flying Training Wing at San Angelo Army Airfield, Texas. The school was initially equipped with B-24Ds that were assembled across the runway at Consolidated, later it was upgraded to B-24Es that were manufactured at Consolidated's Willow Run Plant in Michigan, then flown to the Fort Worth plant for final modifications. During training, nine-member crews were assigned to each plane, and the crews ate, slept and trained together 24-hours a day. This allowed the crew to learn both the technical skills needed for aircraft operation as well as the other crew members minds and reactions. Each day they trained five hours in the air and five hours on the ground. Each class lasted four and one-half weeks. Training officials added a Bomb Approach School in October 1943, which incorporated teamwork between a pilot and bombardier. In addition the 9000th WAC Company of the Women's Army Corps were used in the control tower as well as in the communications office of the base. In late 1944, the B-24 training was phased out at Fort Worth AAF, being replaced with a B-32 Dominator Flight Crew Conversion Training School. Training Command instructor pilots were flown to the Consolidated manufacturing plant in San Diego to learn about the Dominator, which was planned as a stablemate of the B-29 Superfortress; much like the B-17 Flying Fortress was teamed with the B-24 Liberator. The first B-32 arrived at Fort Worth in September 1944, however it was in the modification plant until January before it was released to the training school. By the end of 1944, only five production aircraft had been delivered by Consolidated; by comparison the B-29 had been flown in combat for nearly six months. The Army was quite unhappy about the Dominator and the production problems it was experiencing. Eventually 40 TB-32 trainers were produced for the training program to get underway. Prospective B-32 pilots underwent 50 hours training in the TB-32s and co-pilots received 25 hours of flight time and 25 hours of observer training. Ultimately, a shortage of equipment meant the B-32 training at Fort Worth was never fully realized and after V-J Day, officials eliminated the B-32 training program. 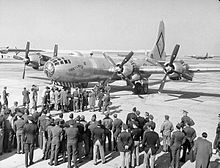 In November 1945, jurisdiction of Fort Worth AAF was transferred to Second Air Force, which established its 17th Bombardment Operational Training Wing at the base, equipped with B-29A Superfotresses. 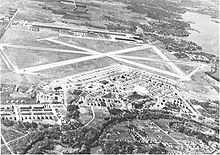 The Air Force had decided to keep Fort Worth as a permanent airfield and in 1946, constructed an 8,200 ft North-South extra heavy-duty runway for future use. The number of completed B-32s at the Consolidated plant had reached 74 production aircraft, along with the TB-32 trainers; many of which were parked at the field. These were ordered flown from Fort Worth directly to storage at Davis-Monthan and Kingman Fields, Arizona for disposal, and the partially assembled B-32 aircraft in the plant were ordered scrapped in place. Fort Worth AAF was assigned to the newly formed Strategic Air Command in March 1946, and on 1 October 1946, the 7th Bombardment Group, Very Heavy was activated. With its activation, the 7th became part of the Fifteenth Air Force (15 AF), headquartered at Colorado Springs, Colorado. Personnel and aircraft of the new group, consisting of the Boeing B-29 Superfortress, were transferred to Fort Worth AAF from the 92nd Bombardment Group at Spokane AAF, Washington. On 1 November 1946, the Eighth Air Force moved its headquarters to Fort Worth AAF from MacDill Field, Florida. Since 1942, the XB-36 Peacemaker had been under development by Consolidated, and work on it was shifted from its San Diego, California plant to its government-leased plant in Fort Worth. By 1947 the initial production version B-36A was ready and in June 1948 the first Convair B-36A Peacekeeper was delivered. The first B-36A was designated the "City of Fort Worth" (AF Serial No. 44-92015), and was assigned to the 492d Bomb Squadron. B-36s continued to roll out from the production plant throughout 1948 and being assigned to the 7th. The group's last B-29 being transferred on 6 December to the 97th Bomb Group at Biggs AFB. For 10 years, the "Peacemaker" cast a large shadow on the Iron Curtain and served as our nation's major deterrent weapons system. In January 1951, the 7th took part in a special training mission to the United Kingdom. The purpose of the mission was to evaluate the B-36D under simulated war plan conditions. Also, further evaluate the equivalent airspeed and compression tactics for heavy bombardment aircraft. The aircraft, staging through Limestone AFB, Maine, would land at RAF Lakenheath, United Kingdom, following a night radar bombing attack on Heligoland, West Germany. From there the bombers would conduct a simulated bomb run on the Heston Bomb Plot, London, finally landing at RAF Lakenheath. On 1 December 1948 the 11th Bombardment Group was reactivated by SAC at Carswell AFB and was equipped with B-36s. 7th Bomb Group personnel began training the new 11th group people in the new aircraft and the 11th soon began receiving them. In 1947, shortly after the United States Air Force was established as a separate branch of the United States military, the Hobson Wing-Base Organization Plan was implemented. The 7th was selected as one of the "Test Wings" to evaluate the new organization T/O and on 17 November 1947 the 7th Bombardment Wing was established. The test was successful and the wing was made permanent on 1 August 1948. As part of the new organization both the 7th and 11th Bombardment Groups became its operational component. On 16 February 1951 the 11th Bombardment Wing was activated and the group was assigned to it. The 19th Air Division was organized the same day at Carswell. With this move the division assumed responsibility over the 7th and 11th Bomb Wings at Carswell. The wing's mission was to prepare for global strategic bombardment in the event of hostilities. Under various designations, the 7th Bomb Wing flew a wide variety of aircraft at the base until its inactivation in 1993. A five ship B-36 formation was flown on 15 January 1949, in an air review over Washington, D.C., commemorating the inauguration of the President of the United States, Harry S. Truman. In 1954, Carswell was prominently featured and used as a filming location in the James Stewart and June Allyson film Strategic Air Command. 11th Bomb Group B-36s appeared with James Stewart who was also attached to the unit in the 1950s as a reserve commander. On 16 February 1951 the 11th Bombardment Wing was activated and the group was assigned to it, although all group resources were transferred to the wing until the group was inactivated in June 1952. The wing deployed to Nouasseur AB, French Morocco from 4 May until 2 July 1955. The Wing won the SAC Bombing Competition and the Fairchild Trophy in 1954, 1956 and 1960. 7–11 must have been considered a lucky combination, because the two wings continued to share Carswell Air Force base until 13 December 1957, when the 11th moved to Altus AFB, Oklahoma and began receiving B-52 Stratofortresses. During January 1958, the wing began transferring its B-36 bombers to various SAC wings. On 20 January, the wing transferred all B-52 equipment and property on hand to the 4123rd Strategic Wing in order to facilitate that organization's conversion, which was scheduled several months ahead of the 7th Bomb Wing at Carswell. On 30 May, Memorial Day, the last of the B-36's in the wing were retired with appropriate ceremonies and "Open House". Air Force and civilian personnel of the base, and civilians from surrounding communities were on hand to bid the "Peacemaker" a fond farewell. This last flight of a B-36 phased out completely the B-36 program in the wing. On 10 December 1957, the 98th Bomb Squadron was detached from the wing and assigned to the newly activated 4123rd Strategic Wing at Carswell. This would become the first Boeing B-52 Stratofortress unit at Carswell. The 7th Bomb Wing officially became a B-52 organization with the adoption of manning documents and equipping authorizations on 1 February 1958. On 19 February 1958, the 4123d Strategic Wing took possession of the first Boeing B-52 Stratofortress on Carswell. At the arrival ceremony on base the bomber was named "The City of Fort Worth". It was subsequently assigned to the 98th Bombardment Squadron of the wing. Shortly following the arrival of B-52 bombers to the 4123rd Strategic Wing, the unit was moved to new facilities at Clinton-Sherman AFB, Oklahoma. With the acquisition of the Boeing B-52 Stratofortress, all new B-52 wings would operate with an air refueling squadron to support those bombers. As a result, SAC activated the 7th Air Refueling Squadron at Carswell on 1 April 1958, and assigned it to the wing. The squadron would be equipped with the Boeing KC-135 Stratotanker later in the year. In January 1959. B-52s from Carswell were constantly in the air and flying to Europe, Asia, and North Africa. Rotational deployments to Guam, and also to U-Tapao Royal Thai Navy Airfield, Thailand continued on a reduced scale until 1975. In the 1980s the 7th received several new weapons systems, including modified B-52H aircraft. In 1983, B-52 crews began training with a new weapon system, the SRAM (Short Range Attack Missile) and later, in 1985, the ALCM (Air Launched Cruise Missile). Also, the wing flew numerous atmospheric sampling missions during 1986 and 1987 in response to the Chernobyl nuclear reactor accident; four B-52H aircraft (s/n 60-0024, 60-0033, 60-0051 and 60-0052) were modified to carry atmospheric sampling pods code-named "Giant Fish". These aircraft flew the mission into the 1990s from various bases including Carswell. By 1984 Carswell was the largest unit of its kind in the Strategic Air Command. The 7 BW contributed personnel to Operation Desert Storm in the Middle East in 1991. After an overwhelming victory in the Persian Gulf, the wing returned to Carswell. In September 1991 with the end of the Cold War, President Bush ordered a stand down of all nuclear alert duties. After July 1961, the wing continued further B-58 evaluations until June 1962. One of its first duties of the 43d was to operate a school to evaluate the new supersonic jet bomber. On 12 January 1961, Major Henry J. Deutschendorf commanded a B-58 crew from the 43rd that set out to break six flight records; five of which the Soviet Union held. The Hustler flew two laps around a course with Edwards AFB, California, at one end and Yuma, Arizona, at the other. The bomber set three speed records over the 1000 kilometer (km) course with a 2000 kilogram (kg), 1000 kg, and 0 kg payload—averaging 1,200.194 miles per hour (mph) in each category. The crew managed an average speed of 1,061.88 mph (1,708.93 km/h) in each of the same payload categories over the 2000 km course. This flight set the pace for the 43rd with the B-58. From then until the close of 1969 the wing served as one of two SAC B-58 wings with a strategic bombardment mission. One of the last things the wing did while at Carswell AFB took place on 28 March 1964, the day after a major earthquake devastated Alaska. Headquarters USAF tasked the 43rd to provide it with photographs of the region hit by the quake. Members of the 43rd flew two B-58s the 5,751 miles (9,255 km) to Alaska and back, processed the film, and then delivered the pictures to Washington DC 14.5 hours after the wing received the request. Six months later the 43rd Bomb Wing moved to Little Rock AFB, Arkansas. In addition to the SAC units, the United States Air Force Reserve 916th Troop Carrier Group, flew Douglas C-124 Globemaster II aircraft from Carswell. It was activated on 1 April 1963. The group supported missions included military airlift to South Vietnam beginning in 1965 and to U.S. forces in the Dominican Republic during a 1965 crisis. It also participated in numerous humanitarian airlift missions. as well as performed tactical airlift missions within the United States. During the 1992 Air Force-wide reorganization, SAC was disestablished on 1 June. Carswell and the 7th Bomb Wing were assigned to the newly created Air Combat Command (ACC), and the B-52Hs assigned to the wing were given the ACC tail code "CW". First-stage closure activities were initiated in 1992 and B-52H aircraft were relocated to Barksdale AFB, Louisiana by January 1993. The 7 BW was released of all operational capabilities on 1 January 1993, and was transferred to Dyess AFB, Texas without personnel or equipment on 1 October 1993 where it currently flies the B-1 Lancer. In 1993, Congress directed the establishment of the nation's first joint reserve base under the Base Realignment and Closure authority. Carswell ceased USAF active duty operations on 30 September 1993, and was transferred to the Air Force Base Conversion Agency (AFBCA) for property distribution and reuse. On 1 October 1993, the Air Force Reserve's 301st Fighter Wing assumed base responsibilities, establishing Carswell as Carswell Air Reserve Station. The Air Force Reserve's Headquarters, 10th Air Force (10 AF), also relocated to Carswell from Bergstrom AFB, Texas as a result of the BRAC action which closed Bergstrom. The USAF ended operational control of Carswell on 30 September 1994 with the transfer of the property to the United States Navy. 19th Air Division, 16 February 1951 – 16 June 1952; 16 June 1952 – 30 September 1988. Air Force One (VC-137C 62-6000) landed at Carswell AFB shortly after 11:00 pm on 21 November 1963 carrying President Kennedy and his entourage to Fort Worth. The next morning, 22 November, President Kennedy returned to Carswell AFB at 11:25 am and boarded Air Force One for a 15-minute flight to Love Field, Dallas, Texas. It was the last use of Air Force One by President Kennedy before he was assassinated later that day in Dallas. ^ a b c d e f g h i j k l m n o p Mueller, Robert (1989). Air Force Bases, Vol. I, Active Air Force Bases Within the United States of America on 17 September 1982. Washington, DC: Office of Air Force History. ISBN 0-912799-53-6. ^ "USAF Museum Boeing B-50A "Lucky Lady II" Factsheet". Archived from the original on 2014-12-10. Retrieved 2014-04-27. ^ a b c 11th Bomb Group (H): the Grey Geese. Pahukah, Kentucky: Turner Publishing, 1996. ISBN 1-56311-239-6. ^ a b c d Ravenstein, Charles A. (1984). Air Force Combat Wings, Lineage & Honors Histories 1947-1977. Washington, DC: Office of Air Force History. p. 5. ^ a b c d e "7th Bomb Wing History Office, Dyess AFB". Archived from the original on 2014-10-18. Retrieved 2014-04-27. ^ "AFHRA 916th Air Refueling Wing History" (PDF). Archived from the original (PDF) on 2013-02-22. Retrieved 2014-04-27. ^ "301st Fighter Wing History". Archived from the original on 2014-04-28. Retrieved 2014-04-27. ^ a b c d e Rogers, Brian (2005). United States Air Force Unit Designations Since 1978. Hinkley, England: Midland Publications. ISBN 1-85780-197-0.